How Much Water Do Marigold Flowers Need? How Long Does it Take for a Marigold Seed to Sprout? 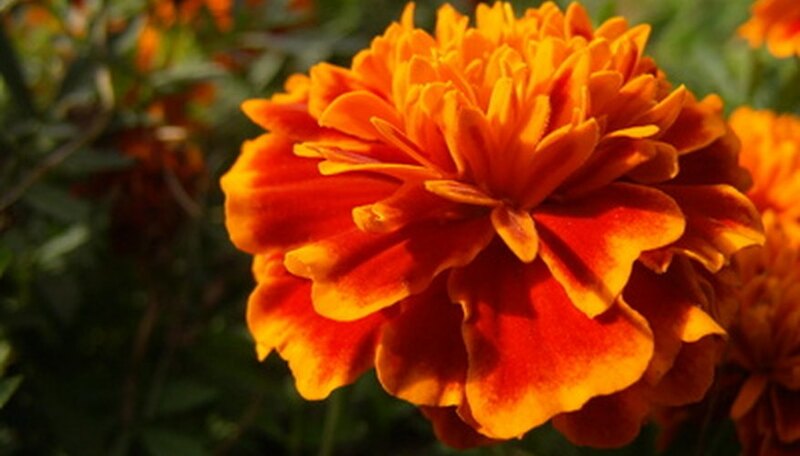 Is an Orange Marigold Flower Poisonous? Man has planted the fragrant marigold amid garden vegetables to deter everything from beetles to animals in search of dinner. According to Robin Howe and Beth Musgrove, of the Alabama Cooperative Extension System, although much of the effectiveness of marigolds in the garden relies on anecdotal evidence, marigolds do provide a method of controlling garden pests. Marigold plants contain toxins that help eliminate root knot and other nematodes. Nematodes, tiny microscopic worms, damage the roots of vegetables, particularly tomatoes. According to Jeff Schalau, county director at the Arizona Cooperative Extension, planting marigolds reduces the number of nematodes in the soil the following year. Although there is little evidence that marigolds repel insects, according to the Arizona Cooperative Extension, marigolds do attract beneficial insects, such as ladybugs, lacewings and parasitic wasps. These insects prey on harmful garden insects, providing natural insect control. What many gardeners perceive as the marigold's ability to repel insect pests may actually be a result of the beneficial insects they attract. F. Robert Henderson, extension specialist from Kansas State University, reports that although it has not been scientifically verified, planting marigold borders around gardens may deter moles. According to WildLife & Natural History Q-line, marigolds may successfully deter deer. Marigolds brighten the garden with their bright yellow and orange blooms atop bright green foliage. These highly scented plants release a pungent fragrance when brushed. Marigolds attract butterflies and other flying insects, adding both movement and beauty to the garden. French marigolds bush out to 6 to 12 inches high, with 2 inch flowers. African marigolds (aka American marigolds) grow to 3 feet high. Triploid marigolds, a cross between French and African marigolds, have sterile, 3-inch wide flower heads. Colors are red, gold and yellow. 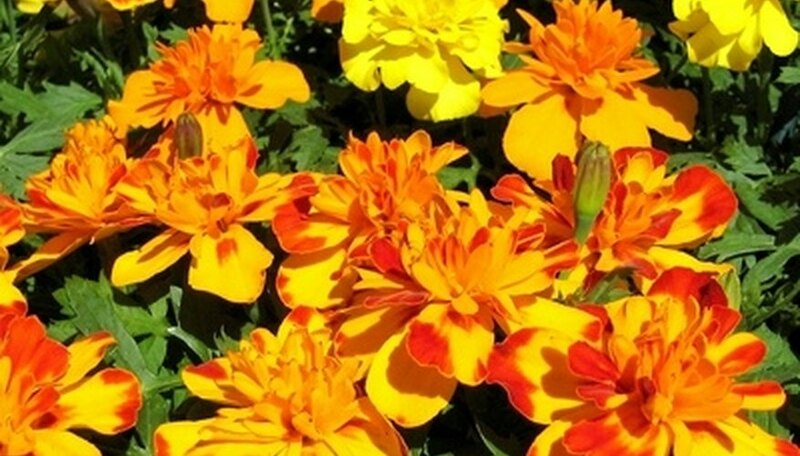 Plant marigolds in full sun and water if there are periods of drought. They can live in most any soil and are nearly effortless to grow. Good soil, compost and care ensure full and robust growth. Marigolds die with the frost, so they prefer hardiness Zones 9 to 11. Propagate by sowing the very thin black seeds directly into the soil. Thin to a foot apart after the seedlings are about 1 to 2 inches tall. Tagetes lucida, known as Mexican tarragon, can be a substitute for French tarragon, a kitchen spice. Marigolds can be classified by four common species: African marigolds, French marigolds, triploid marigolds and single marigolds. A fully grown plant measures anywhere from 6 inches to 4 feet high, with a spread of 6 inches to 3 feet. Triploid marigolds are often the largest, and French marigolds the smallest. Marigolds will grow in nearly any warm to temperate climate. They do not survive well in colder climes. They prefer to be planted in full sun, approximately eight to 16 inches apart in moist, well-drained soil after the danger of frost has passed. Marigolds produce a pungent smell that deters many insects, but spider mites and spittle bugs may still find marigolds to be a tasty treat. Keep soil moist but not overly wet. Remove any flowers that have died, a process called "deadheading." This will ensure that the plant blooms throughout the spring and summer. Fertilizers rich in phosphorous will encourage flower growth. Fill small peat pots with potting soil, about a month before the expected last frost. Plant several marigold seeds per pot just below the surface of the soil. Moisten the soil and put the peat pots in a shallow tray with several centimeters of water. Ensure that the soil in the peat pots remains moist and place the seeds in a warm, dark area until they sprout. Bring the sprouted marigold seedling out when the first two leaves are visible. Place them in the sun. Cull the smaller, weaker plants. Leave one plant per small peat pot. Begin to accustom the seedlings to outdoor temperatures by putting them out in the morning and bringing them in in the evening. Plant your marigold seedlings in their final pots. By using peat pots, the entire seedling pot can be planted. Pinch off the spent flowers to encourage further flowers and growth. Choose a gardening site. Marigolds grow best and produce the most blossoms when reared in a sunny location. Prepare the garden soil. Remove any surface vegetation and debris. Break the soil into fine clumps to a depth of 6 inches. Amend the soil with 2 to 4 inches of compost, mixed thoroughly into the top of the dirt. Plant the marigold seeds. Bury the seeds 1/4 inch below the soil surface, say experts at West Virginia University. Spacing varies according to the specific marigold variety. For example, French marigolds are often dwarf in size while African marigolds can spread as far as a couple feet. North Carolina State University suggests spacing the seeds apart by 10 to 12 inches. Water the sown seeds. Apply moisture twice daily or as necessary to keep the area moist. The seeds will typically germinate within a week. Pinch off dead marigold flowers when the petals begin to dry. Marigolds are one of the few flowers that do not produce a seed pod separate from the bloom. Seeds are formed in the cup-like formation under the flower petals. Tear spent marigold flowers apart with your fingers on an old screen or a sieve. Seeds consist of three colored sections--the colored remnant of the flower petal, a white tubular piece connected to the black seed at the bottom. Allow a few days to dry on the screen. The flower petals and white part will continue to wilt and disintegrate, leaving the black seed. Store seeds in labeled envelopes in a glass jar or other container with a tight lid. Dwarf French marigolds (Tagetes patula) are compact, bushy plants which reach up to 12 inches and have flowers 1 to 2 inches in diameter. The flowers may be single, double, crested or tufted, and come in shades of yellow, gold, orange and mahogany-red. The bi-colors, which have contrasting colors on the edges, are sometimes called “brocades”. Marigolds require moist well-drained soil and full sun. 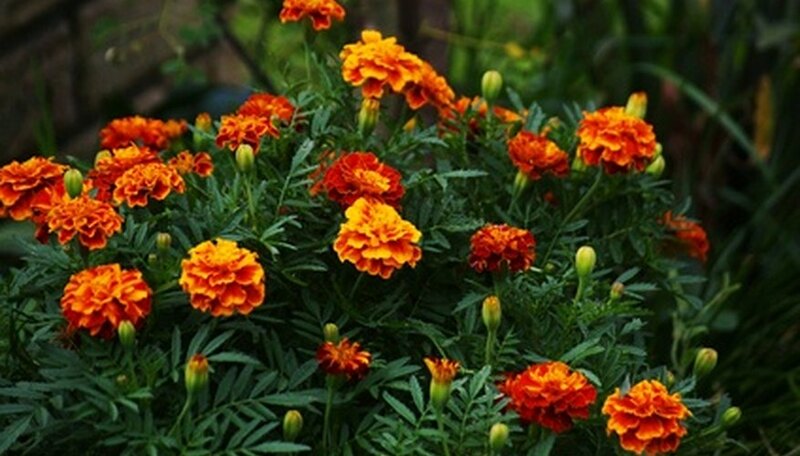 Plant the dwarf marigold varieties 6 inches apart. Keep plants deadheaded to encourage new blooms. Marigolds are native to Mexico. The French marigold is so called because the French developed new hybrids of Tagetes patula. The Disco series is 8-10 inches and free-flowering. The Little Hero series is an early blooming crested-type with large (up to 2 1/2 inches) flowers. Marigolds are useful as bedding plants and for containers. The dwarf varieties in particular make excellent edging plants. When planted in masses they provide brilliant color. Marigolds suffer few problems from pests or disease. In fact, French marigolds are often planted near vegetables to fend off root-knot nematode. Marigolds are fairly drought tolerant, but produce more blooms if kept evenly moist, especially during hot weather. They need well-drained soil that is not soggy. Marigolds grown in containers dry out more quickly than those in flower beds or vegetable gardens. Clay and plastic pots, especially, dry out quickly. These plants may need daily watering during hot weather. A moisture meter inserted in the soil quickly alerts gardeners to dry soil conditions. In addition to regular waterings, marigolds thrive in full sun. They are not at all cold hardy and are planted either from seed or nursery purchased plants after the last frost. They may also be started indoors six to eight weeks before the last frost. They bloom 45 to 50 days after planting, according to West Virginia University Extension Service. Sow vegetables seeds in the prepared garden bed. Plant vegetable seedlings in your garden bed, leaving an empty space every two plants. Sow marigold seeds, two to three, in the empty spaces between vegetable seedlings. Cover the seeds with soil and lightly tamp it down. Sow the remaining marigold seeds along the borders of the vegetable garden. Water and fertilize marigolds the same time you water and care for your vegetable garden. Remove spent blooms to promote continuous blooms during the growing season. Many gardeners are looking for solutions to garden pest problems that are non-toxic and earth-friendly. Marigold is a long-established companion plant that does no harm to children and pets. It mitigates many garden problems without causing harm to the target plant or other plants. Marigold imparts no toxicity to food crops. Marigold contains thiopene, a chemical toxic to many soil-borne pests. Thiopene gives marigold its distinctive odor and flavor, which makes it practically immune to garden pest problems. Nematodes, a soil-borne parasite causing plant decline and death in many vegetable and ornamental plants are repelled by the thiopene that marigold emits into the soil through its roots. Insects are repelled by the strong, chemical odor of marigold. Soft-bodied, sucking insects, like aphids, are particularly adverse to the chemical smell and flavor of marigold. Marigold is very effective against carrot root fly. Deer hate the smell and flavor of marigold. Vegetables and ornamentals planted near marigolds are less likely to be eaten by deer. Plant marigold in rows in the vegetable garden as a barrier to nematodes and other soil-borne parasites. Plant near tomatoes and root vegetables. Thiopene will penetrate the soil, making surrounding areas less susceptible. Marigolds planted near roses will help repel aphids, which associate marigold’s smell with its unpalatable flavor. There are many different types of marigolds that range from 6 to 36 inches tall. The color varieties include yellow, orange, red, white and multi-colored. Plant marigold seeds in seed trays filled with moist, good-draining soil. Spray the soil with room temperature water before planting. Marigold seeds do not require light to sprout. Sprinkle the seeds on top of the soil and cover with vermiculite or sand. Place the seeds in a warm area and keep moist. Fertilize the marigold seedlings once they develop true leaves. Dilute 15-0-15 water-soluble fertilizer to quarter strength and use twice a week. Store seeds from one year to another in a cool, dark area. Keep the seeds dry or they may unexpectedly sprout. Protect them from insects and rodents. The common marigold (Tagetes erecta or Tagetes patula) grows where night temperatures do not drop below 60 degrees Fahrenheit. In colder parts of the United States, marigolds are grown as an annual plant. Marigolds love soil rich with organic matter. Mix compost into your beds 6 to 10 inches deep prior to planting starts. Choose a location with good drainage and full sun. Leave 6 to 9 inches between French marigold varieties and up to 18 inches between the larger African hybrids. Marigold seeds are some of the easiest annual flowers to start yourself. Sow seeds indoors as early as eight weeks before the last frost date. Germinate by sowing seeds in soil, covering lightly and keeping moist for up to two weeks. When seedlings are sturdy, transplant after all danger of frost is past. Marigolds require little maintenance aside from deadheading old blooms. Pinch spent blooms just below the bud to encourage new growth and more flowers. Tall varieties can be staked with garden dowels or canes and tied loosely with twine to prevent buckling or felling during storms. Marigolds are edible but have a bitter flavor. The signet marigold can be harmful if eaten in large amounts. Marigolds are used as an herbal remedy for skin inflammation. Home gardeners can choose from a variety of marigold species, ranging in size from 6 to 48 inches tall with a similar spread. Abundant flowers appear in shades of orange, maroon, cream and yellow. Foliage is lacy and dark green. The four basic species of marigolds are: African, French, triploid and signet. Each of these species consists of many hybrids with variations in color and size. Moist, loamy soil produces the best flowers. Marigolds prefer full sun but will grow in partial shade. They are tender tropical plants killed by frost, but grow just about anyway as annuals. Stake taller species such as African or Aztec marigolds to prevent damage from wind. Pinch off spent flowers from all types to encourage additional flowering. In hot, dry weather, spider mites may attack marigolds. Garden slugs also like to eat the plants.